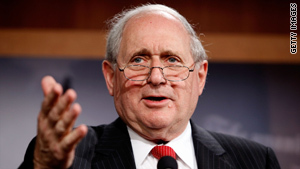 Sen. Carl Levin, Armed Services Committee chief, says Afghan leaders and the U.S. military think payoffs could work. Mullah Brader Akhund calls the strategy "an old weapon that has failed already"
Kabul, Afghanistan (CNN) -- A top Taliban political leader delivered a message Friday to President Obama, calling his attempt to lure away Taliban fighters with money "an old weapon that has failed already." "The Mujahedeen of the Islamic Emirate of Afghanistan are not mercenaries and employed gunmen like the armed men of the invaders and their surrogates," Mullah Brader Akhund said in the statement. "This war will come to an end when all invaders leave our country and an Islamic government based on the aspirations of our people is formed in the country." Akhund is the deputy emir of the Islamic Emirate of Afghanistan, which is the political arm of the Taliban. He was referring to the Taliban reintegration provision, part of the $680 billion defense appropriation bill that Obama signed Wednesday to pay for military operations in the 2010 fiscal year. The provision would separate local Taliban from their leaders, paying the fighters to quit the organization, replicating a program used to neutralize the insurgency against Americans in Iraq, according to the Sen. Carl Levin, chairman of the Senate Armed Services Committee. Akhund said 19th century British invaders and Soviet fighters in the 1980s tried the same tactic, unsuccessfully. He said the Taliban consider the U.S. measure "a sign of weakness and complete despondency of the enemy." Obama is considering whether to approve the request from his top commander, Gen. Stanley McChrystal, for as many as 40,000 additional troops in Afghanistan. The decision is being weighed against the backdrop of suddenly spiraling U.S. military fatalities. Fifty-six American troops have died in Afghanistan in October, the highest U.S. monthly toll since the war began eight years ago. Video: Should we pay the Taliban? Obama meets Friday with the Joint Chiefs of Staff, who will tell the U.S. leader how a large deployment to Afghanistan would affect the military. Akhund warned Obama against maintaining a military presence in Afghanistan, saying it "will only deepen your economic crisis and will harm your international reputation." "Pull all your forces out of our prideful country and put an end to the game of colonialization by shedding the blood of innocent Muslim people under the unjustified name of terrorism," he said. The Taliban reintegration provision is part of the Commander's Emergency Response Program, which is now receiving $1.3 billion. CERP funding also is intended for humanitarian relief and reconstruction projects at commanders' discretion. "Afghan leaders and our military say that local Taliban fighters are motivated largely by the need for a job or loyalty to the local leader who pays them and not by ideology or religious zeal," Levin said in a Senate floor speech on September 11. "They believe an effort to attract these fighters to the government's side could succeed, if they are offered security for themselves and their families, and if there is no penalty for previous activity against us." While the plan has a "reasonable chance for some success," analyst Nicholas Schmidle said that it may not be a long-term solution. "So long as the Americans are keenly aware of this, you're buying a very, very, very temporary allegiance," said Schmidle, an expert on the Afghanistan-Pakistan region for the nonpartisan New America Foundation. "If that's the foundation for moving forward, it's a shaky foundation." Peter Bergen, CNN security analyst, said the idea of paying off Taliban members to quit is nothing new. "There's been an amnesty program for low-level Taliban in place for many years now, and thousands of people have taken advantage of it," he said. "So this is not entirely a new idea. The idea of bribing people, local guys, to come over. ... It's one of the most cost-effective ways to get people to lay down their arms, either to negotiate a peace or coerce them." McChrystal has backed the Taliban reintegration plan, saying that most are not ideologically or even politically motivated. "Most of the fighters we see in Afghanistan are Afghans, some with [a] foreign cadre with them," he said in a July 28 Los Angeles Times interview. "Most are operating for pay; some are under a commander's charismatic leadership; some are frustrated with local leaders." CNN's Ed Hornick, Thomas Evans, Adam Levine, Barbara Starr and Nic Robertson contributed to this report. Analysis: What's at stake in Afghanistan and Pakistan?